Dimensions 0.71 by 5.49 by 8.19 in. 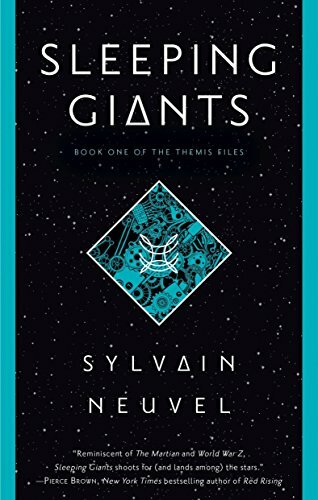 Amazon.com description: Product Description: A page-turning debut in the tradition of Michael Crichton, World War Z, and The Martian, Sleeping Giants is a thriller fueled by an earthshaking mysteryâand a fight to control a gargantuan power. Seventeen years later, the mystery of the bizarre artifact remains unsolvedâits origins, architects, and purpose unknown. Its carbon dating defies belief; military reports are redacted; theories are floated, then rejected. Rose Franklin is now a highly trained physicist leading a top secret team to crack the handâs code. And along with her colleagues, she is being interviewed by a nameless interrogator whose power and purview are as enigmatic as the provenance of the relic. Whatâs clear is that Rose and her compatriots are on the edge of unraveling historyâs most perplexing discoveryâand figuring out what it portends for humanity. But once the pieces of the puzzle are in place, will the result prove to be an instrument of lasting peace or a weapon of mass destruction?